Regardless of your feeling on the paint job, that bridge is an interesting design. They've been using that bridge on 58/59 type Jazzmasters from the Custom Shop. I think somebody on offset requested they sell the bridge separately but it never happened. I thought I'd seen that before. Still quite intriguing. Edit: *aside from this though, it might actually sound/function pretty well. They've been putting it on CS stuff for a year or so now, which I suspect they wouldn't do if it was rubbish. I'm not a fan of brass as a bridge material. Also yeah, you won't get perfect intonation but if they're angled like that, not too bad. I generally use a wound G so intonation would be tricky for those style of bridges. Just a cheap looking Mastery clone. 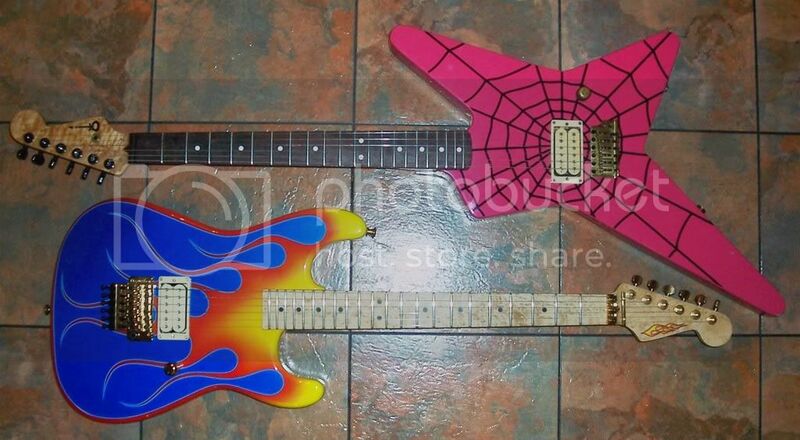 Can't remember if the one I saw back then was Kramer or Charvel.